Double Blind opens with a stark, sterile, floodlit stage where two dancers immediately engage in a play of shocking each other with electric cables accompanied by a shuddering soundtrack of electronic reverb. 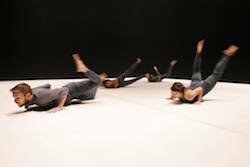 It is in equal parts comic and disturbing as they engage in an almost senseless dance of action-reaction that combines choreography of shuddering, wrestling and a mix of contemporary street dance styles and rhythms. As its title would suggest, Double Blind is inspired by the process of scientific experimentation — in particular, the iconic social and psychological experiments undertaken in the 1960s that underlined the suppressed violence, conformity and subservience to authority, as well as the manipulation that lurked behind the façade of many “normal people” and social situations. Choreographer Stephanie Lake says Double Blind asks the question, “How far can one be pushed to act outside one’s moral code when instructed?” Much of this performance is quite simple and episodic as the dancers — Amber Haines, Kyle Page, Alisdair Macindoe and Alana Everett — behave like interchangeable subjects rather than performers. They engage in experiments involving shocking, fighting, group bonding and clapping. Each episode/experiment explores a singular reaction, such as clapping, to instruction, where it explores the various configurations of tempo, reaction and the speed that it entails. There is a type of experimental creativity that emerges as the dancers twist, grapple, shudder and move like microscopic cell-like structures. Much of Double Blind contains rapid transitions of fragmented episodes that contain a strange mix of the everyday, the comic and the disturbing. An overarching theme of manipulation emerges, both from the experimenters and from the subjects. The sense that the subjects are manipulated by both the shadowy experimenter seated behind his control panel, as well as the other participants, creates a disturbing sense of alienation where each dancer reacts rather than dances to the music or to each other. While the minimal and crystalline stage setting with identical costumes suggesting “stylised” hospital gowns seems determined to depersonalise each performer, the intimacy of the stage space combined with the struggle of each dancer means that in a strange counterintuitive way, their individual personalities emerge. And while some of the audience may have found the stark soundtrack overly abrasive, we enjoyed the fast-paced electro score, the locking and popping, and the black, but “laughing-out-loud”, humour. There was a raw street-jamming feel to this very creative work. Double Blind is also coming to Melbourne on February 15-20, taking place at 8pm at Northcote Town Hall. Photos: Double Blind, part of the “About an Hour” series at the 2016 Sydney Festival. Photos by Prudence Upton.